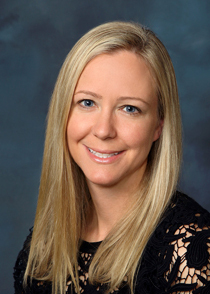 Jill R. Wells, MD, joined the Comprehensive Ophthalmology section in July 2009. She participated in an Ocular Oncology Fellowship at the same time, completing it in 2011, and is also a member of the Ocular Oncology and Pathology section. Dr. Wells received her BA degree in Biology at Rollins College. She attended medical school at the Medical College of Georgia, where she was member of the Alpha Omega Alpha medical honor society and was awarded the Merck Manual Award for a perfect GPA. She then completed her residency at the University of Alabama, Birmingham, where she was chief resident and received the Outstanding Resident Teacher Award. She was also awarded second place in the national Bloomberg Resident Video Competition for cataract surgery given by the American College of Eye Surgeons. Her clinical interests include general ophthalmology, cataract surgery, conjunctival tumors, posterior segment tumors including choroidal melanoma, and retinoblastoma. Dr. Wells is board certified by the American Board of Ophthalmology. She is a member of the American Academy of Ophthalmology and a member of Alpha Omega Alpha medical honor society. She regularly teaches a “Cataract Surgery for Beginners” course at the AAO annual meeting and has given lectures at the Osler Board Review Course. She has published articles and book chapters in peer-reviewed publications and has presented at national meetings. She was recently given an Achievement Award by the American Academy of Ophthalmology.